In this screen shot I was running about 25mph looking for a school of Stripers this morning. I checked out a 20 foot flat [left third of sonar screen] then dropped into the channel and came up on a 30 foot flat. 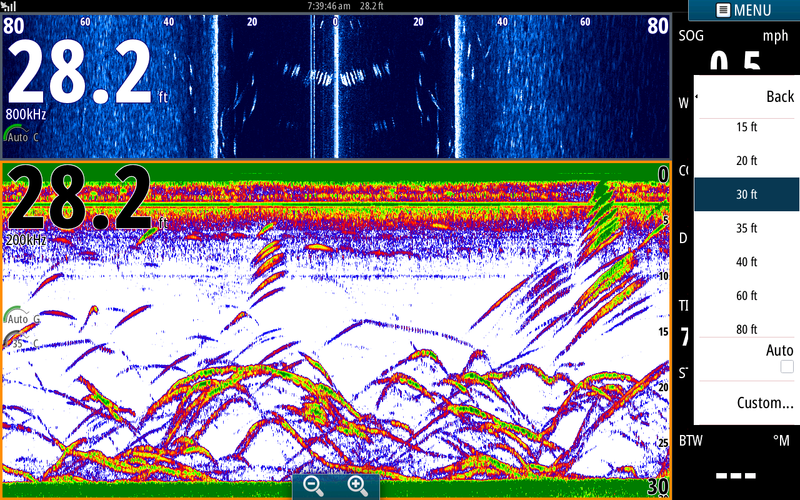 I saw Stripers [mid screen] then slowed to 15mph and verified what they were [about an inch from the right side of the screen]. 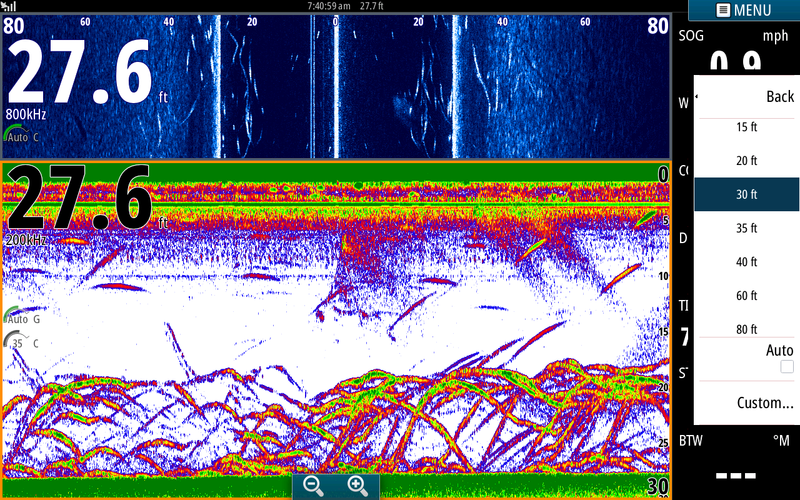 As I was slowing down I also saw Stripers on my side scan [vertical white dashes at 35 feet to the right of the boat in the upper blue screen]. The bait [small white dots] they were working was primarily to the left of the boat so when I stopped I turned the boat to the right and put out our baits. I popped this pic after working the school for about 20 minutes. We were steadily catching fish and this was my first chance to get a pic. You can see these Stripers were active by their streaking. Here is where we came into nicer Stripers. These fish were on the leading edge of the school and there were plenty of them. 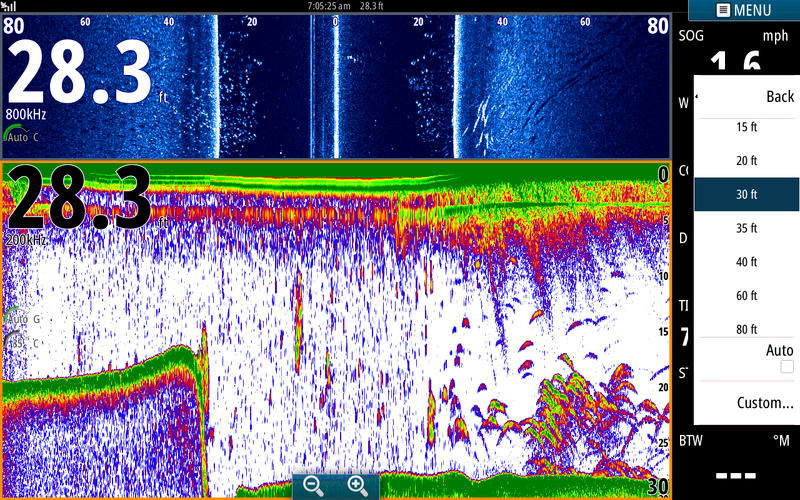 Not only can you see them clearly on the sonar page but you can also see them on my side scan on both sides of the boat. Usually you can see my sinker and bait coming through the school but today I only had three anglers on board and they had no chance of keeping up with the action. We worked the school for a couple of hours and seldom had more than 3 or 4 rods baited. My poor clients ran around the boat like chickens with their heads cut off. Nelson, the gentleman who booked the trip, had been razzing me every time I spoke to him before the trip insisting that I better put him on fish. When he got on the boat I looked at him and told him now it is my time to pay him back and lets see how he can handle the pressure. After a couple hours he had been humbled. Even the Sea Gulls that were sitting on the water were laughing at us. I had told him that he needed at least 4 anglers to handle the action but people backed out at the last minute. When the morning was over we had all worked our buts off and had a lot of fun. Nelson can't wait to come back and get his revenge on those Stripers. I overheard him saying "I just can't believe how many fish are in this lake!"